What is Vivianite? Vivianite is a crystal formation that can form in wastewater treatment plants due to the addition of irons salts such as Ferric Chloride to control orthophosphate and H₂S. It tends to be a blue, green or purple color. 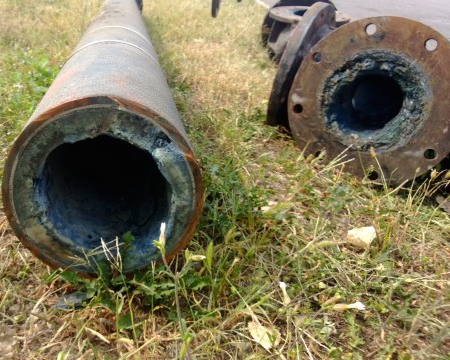 Vivianite, like struvite, can cause a lot of problems for WWTPs as it can develop in pipelines where it can reduce the flow rates, and require maintenance in other areas such as the pumps, etc. Vivianite tends to be harder to remove compared to Struvite due to its composition, but can be removed through product recirculations, standstill soaks low-pressure sprays, and lastly our foaming application. Struvite Removal offers the Struvite and Scale Remover STSR, as well as the Struvite Dispersant and Inhibitor STSP to remove vivianite scale, prevent vivianite scale from occurring again, and ultimately vivianite control, leaving the WWTP to operate as it should scale free.